While living in rainy Seattle eight years ago, Josh Heiser and Steve Burns decided to make a change. “We thought, Where do we want to eventually end up? Why not go there now?” says Josh. And so they did, heading to Sonoma. The prime getaway spot is justly famous for its enviable climate, dreamy grapevines-for-miles landscape, and notable wineries and restaurants. 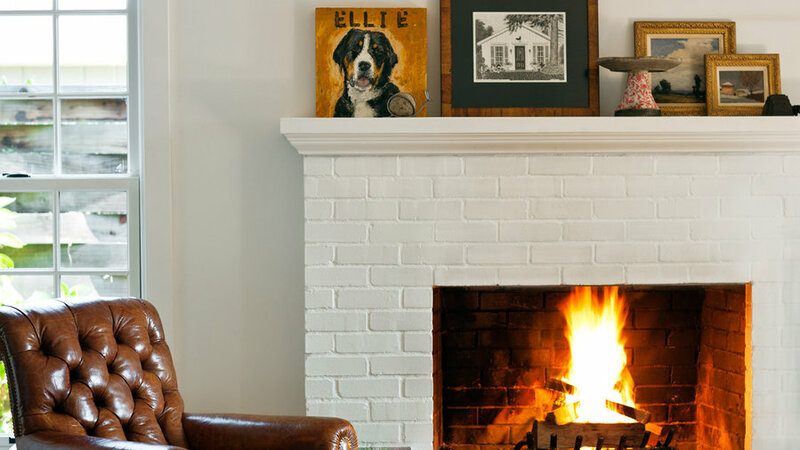 How, then, to keep that away-from-it-all vibe in a home that has to function as, well, a home? 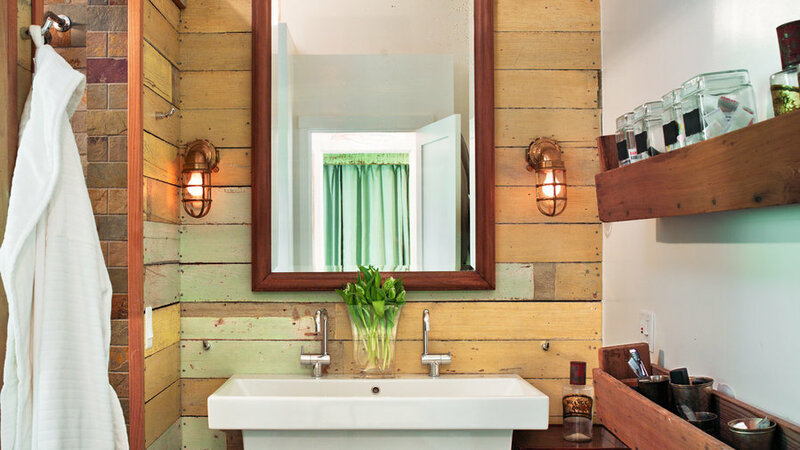 The couple found a onetime cookshack, complete with shaky 1880s foundation and four layers of musty wallpaper, on a half-acre a few blocks from the main plaza. “The original structure was funky at best,” Josh adds. “But the lot was so great, the house was secondary.” That was then. After a thorough and thoughtful update, this is now. Fireplace, sink-in leather chair, and tapestry ottoman give a lodge-like feel to this corner of the 1,100-square-foot home. White walls and sisal carpeting keep the room from feeling too heavy. 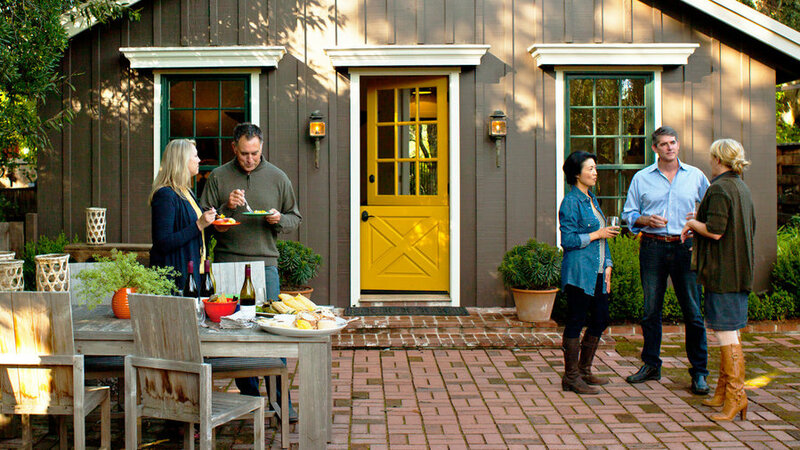 The temperate Sonoma weather means the patio can be in constant use, extending the usable space of the house year-round. During the remodel, Josh and Steve raised the ceiling to make the narrow kitchen feel roomier. 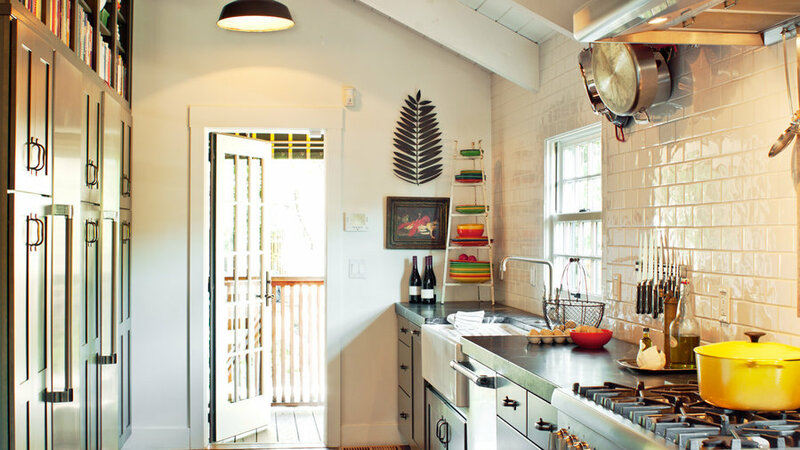 The glory of a vacation home (no in-your-face must-do projects) is re-created with built-in kitchen cabinets and cubbies to stow appliances, dishware, and the stuff of everyday life. Furniture groupings, like this casual dining setup in a windowed corner of the great room, help define discrete living spaces. No walls divide the living area from the kitchen, but there are plenty of retreats throughout the house. The bedroom lies behind the wall hung with the star. 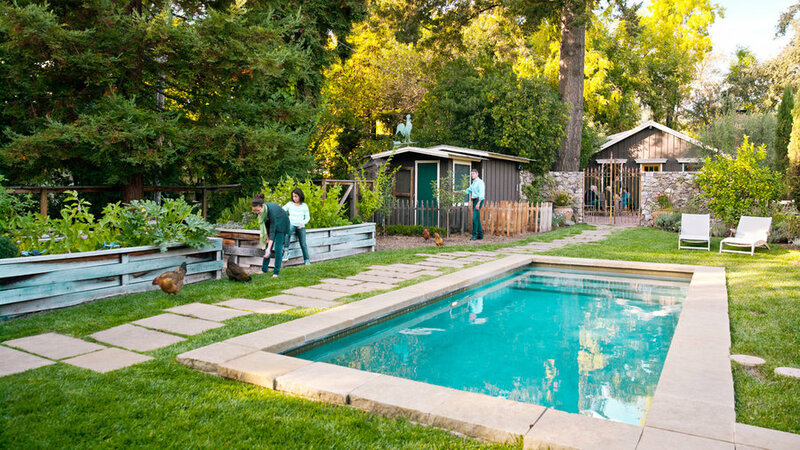 Along with the outdoor dining space, the front yard is home to a dozen chickens, raised vegetable beds, and an in-ground pool (welcome during Sonoma’s hot summer afternoons) as well as a fountain. Three large raised beds overflow with produce almost year-round. In midwinter, the harvest includes mustard, kale, cabbage, onions, and (hard to believe, but it’s true) strawberries.